My close friend Brad sent me a photo from his local Hamiltonian Santa Claus parade. It was of the happy gang of McDonald's mascots. 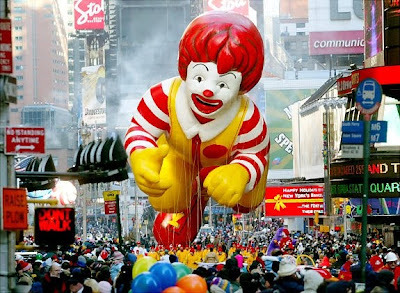 And indeed - pretty much every holiday parade comes replete with fast food mascots in float or balloon form. Interestingly, I can only find reference to branded foods' Macy's inclusion from 1987 onwards. Nearer to me Toronto is the home to a truly world famous Santa Claus parade. Its current sponsors include: McDonald's, Coca-Cola, Redpath Sugar, Nestle's Turtles, Kraft Foods, Tim Horton's, Plantars Peanuts, Shopsy's Deli, and Villagio White Bread. And when I simply googled iconic fast food brands and parades, thousands of pictures came up. 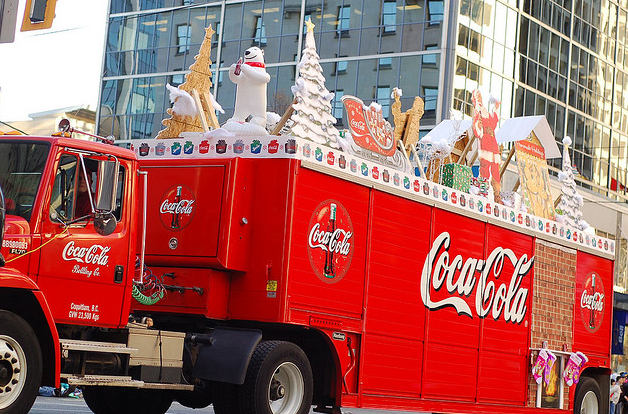 Those pictures included this one of a Coca-Cola float from the 2007 Rogers Santa Claus parade - this from the same Coca-Cola company that regularly claims it doesn't market Coca-Cola to kids. Guess they thought the parade was geared to Santa loving adults. So if you're a parent, and if you're keen on trying to reduce your children's exposure to fast food branding, you'll have to have your kids sit out your local Santa Claus parade. Is there anywhere or anything out there geared towards kids that the food industry hasn't co-opted to market their brands?